Here in this bike pic a member of MORC (Minnesota Off Road Cyclists) checks out a mountain bike trail in Lebanon Hills Regional Park. 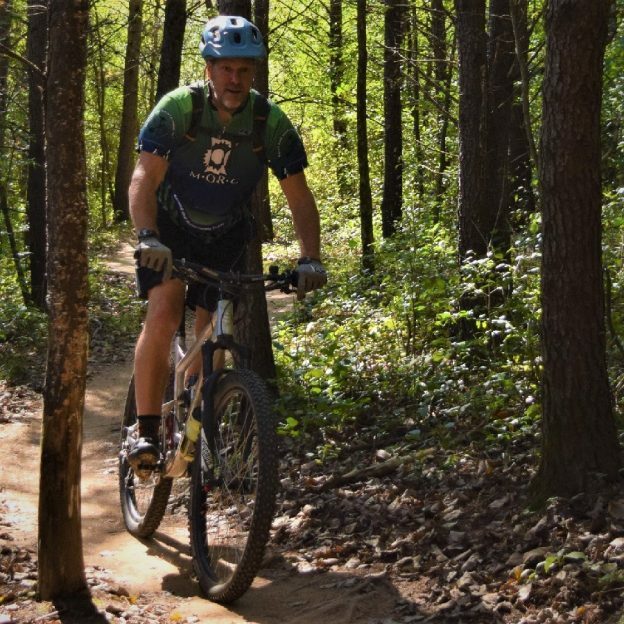 With an alliance created between Dakota County Parks and MORC, eighteen years ago, members of the Off Road organization have been volunteering their time each year to build and maintain the popular trails in the park. If you see a MORC member out on any of Minnesota’s trails, please thank them for all their volunteer efforts. You can also attend the Wild Ride Mountain Bike Festival, on September 22nd and thank MORC members there. For your #NextBikeAdventure view all the fun ideas and bike destinations in the latest iowa or Minnesota Bike/Hike Guide. Then plan your next outing with family and friends in one of Minnesota’s HaveFunBiking Destinations. This entry was posted in Picture of the Day and tagged #nextbikeadventure, free bike maps, Minnesota Bike Guide, Minnesota Off-Road Cyclists, Minnesota trails, MORC, moutain biking, trail riding on August 14, 2018 by Russ Lowthian.